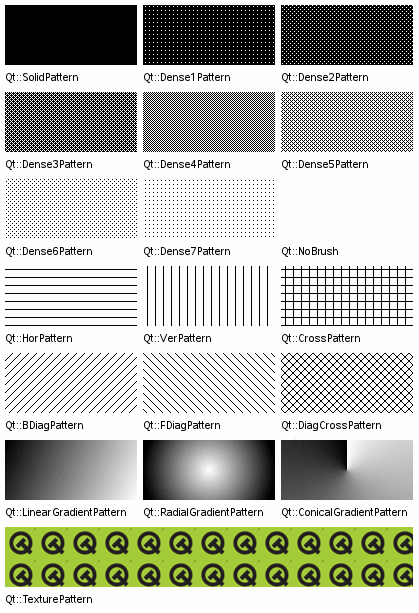 The QBrush class defines the fill pattern of shapes drawn by QPainter. A brush has a style, a color, a gradient and a texture. The brush style() defines the fill pattern using the Qt::BrushStyle enum. The default brush style is Qt::NoBrush (depending on how you construct a brush). This style tells the painter to not fill shapes. The standard style for filling is Qt::SolidPattern. The style can be set when the brush is created using the appropriate constructor, and in addition the setStyle() function provides means for altering the style once the brush is constructed. The brush color() defines the color of the fill pattern. The color can either be one of Qt's predefined colors, Qt::GlobalColor, or any other custom QColor. The currently set color can be retrieved and altered using the color() and setColor() functions, respectively. The gradient() defines the gradient fill used when the current style is either Qt::LinearGradientPattern, Qt::RadialGradientPattern or Qt::ConicalGradientPattern. Gradient brushes are created by giving a QGradient as a constructor argument when creating the QBrush. Qt provides three different gradients: QLinearGradient, QConicalGradient, and QRadialGradient - all of which inherit QGradient. The texture() defines the pixmap used when the current style is Qt::TexturePattern. You can create a brush with a texture by providing the pixmap when the brush is created or by using setTexture(). Note that applying setTexture() makes style() == Qt::TexturePattern, regardless of previous style settings. Also, calling setColor() will not make a difference if the style is a gradient. The same is the case if the style is Qt::TexturePattern style unless the current texture is a QBitmap. The alpha component of the color() is 255. Its texture() does not have an alpha channel and is not a QBitmap. The colors in the gradient() all have an alpha component that is 255. Note that, by default, QPainter renders the outline (using the currently set pen) when drawing shapes. Use painter.setPen(Qt::NoPen) to disable this behavior. For more information about painting in general, see the Paint System. See also Qt::BrushStyle, QPainter, and QColor. Constructs a default black brush with the style Qt::NoBrush (i.e. this brush will not fill shapes). Constructs a black brush with the given style. Constructs a brush with the given color and style. See also setColor() and setStyle(). Constructs a brush with the given color and the custom pattern stored in pixmap. The style is set to Qt::TexturePattern. The color will only have an effect for QBitmaps. See also setColor() and setTexture(). Constructs a brush with a black color and a texture set to the given pixmap. The style is set to Qt::TexturePattern. Constructs a brush with a black color and a texture set to the given image. The style is set to Qt::TexturePattern. Constructs a brush based on the given gradient. The brush style is set to the corresponding gradient style (either Qt::LinearGradientPattern, Qt::RadialGradientPattern or Qt::ConicalGradientPattern). Returns the gradient describing this brush. It is an extended radial gradient. Returns the current transformation matrix for the brush. Sets the brush color to the given color. Note that calling setColor() will not make a difference if the style is a gradient. The same is the case if the style is Qt::TexturePattern style unless the current texture is a QBitmap. Sets matrix as an explicit transformation matrix on the current brush. The brush transformation matrix is merged with QPainter transformation matrix to produce the final result. Sets the brush style to style. Sets the brush pixmap to pixmap. The style is set to Qt::TexturePattern. The current brush color will only have an effect for monochrome pixmaps, i.e. for QPixmap::depth() == 1 (QBitmaps). Sets the brush image to image. The style is set to Qt::TexturePattern. Note the current brush color will not have any affect on monochrome images, as opposed to calling setTexture() with a QBitmap. If you want to change the color of monochrome image brushes, either convert the image to QBitmap with QBitmap::fromImage() and set the resulting QBitmap as a texture, or change the entries in the color table for the image. See also textureImage() and setTexture(). Swaps brush other with this brush. This operation is very fast and never fails. Returns the custom brush pattern, or a null pixmap if no custom brush pattern has been set. Returns the custom brush pattern, or a null image if no custom brush pattern has been set. If the texture was set as a QPixmap it will be converted to a QImage. Returns true if the brush is different from the given brush; otherwise returns false. Two brushes are different if they have different styles, colors or transforms or different pixmaps or gradients depending on the style. Assigns the given brush to this brush and returns a reference to this brush. Move-assigns other to this QBrush instance. Returns true if the brush is equal to the given brush; otherwise returns false. Two brushes are equal if they have equal styles, colors and transforms and equal pixmaps or gradients depending on the style. Writes the given brush to the given stream and returns a reference to the stream. Reads the given brush from the given stream and returns a reference to the stream.